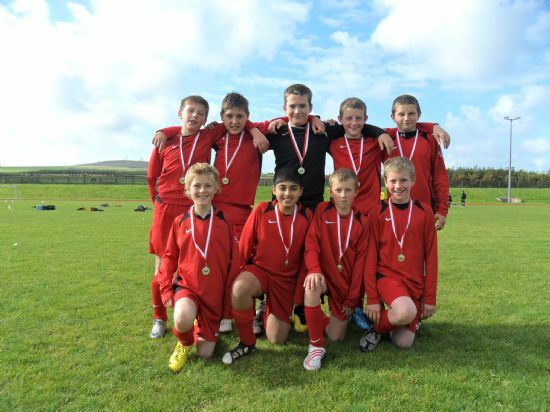 The outdoor club football season came to an end at the weekend of 11/12 September when the annual Orkney/Shetland Under 12 inter-club competition was held at Picky. The Orkney clubs were joined by six visiting teams from Shetland representing Lerwick Rangers, Ness United and Scalloway. Seven teams competed in the A League competition and six teams in the B League competition. After the first day’s games Scalloway lead the A league winning their three games ahead of Thorfinn A who dropped valuable points when they were held to a 2-2 draw by Ness United. Favourites East United won both their opening games, and looked very impressive as they edged into third place. On the Sunday Scalloway were beaten by both East United and Thorfinn and with both Orkney teams winning their remaining games it was down to the final match between East United and Thorfinn to decide the winners of the A League. Needing only a draw East emerged comfortable 3-0 winners in what was at times an overly competitive match. This repeated their victory in the same tournament last season and with almost the same team of players. This was another convincing victory for East United in an excellent season which has seen them win the Whitedale tournament, the S1 & Under League and Cup double, and the Andromeda Cup in Shetland last month. In the B League after the first days matches East United B led by one point although they had played a game more than their nearest rivals Thorfinn B. 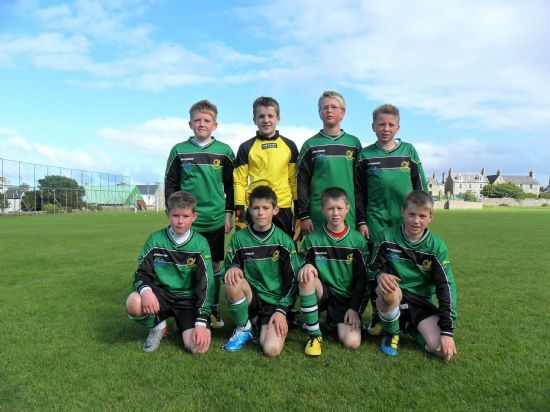 With their team almost entirely made up of players from the Under 11 County squad Thorfinn were favourites for the B League and they convincingly won all their Sunday matches to win the competition by five points from nearest rivals East United B. At the end of the competition OYDG Chairman Jim Cormack thanked all those who had helped make the competition such a success, in particular the visiting teams from Shetland. He also thanked the referees, Picky groundstaff and Stadium Cafe Bar for the hospitality provided. Congratulating both teams on their convincing victories he commented in particular on the incredible record of East United in winning so many competitions at the Under 11/12 age group over the last two years. Medals were then presented to the two winning teams. 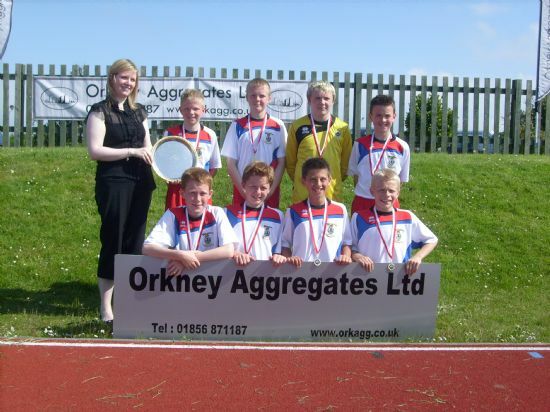 On Saturday 28th August Orkney Under 12's travelled to Shetland to play county matches against Shetland. 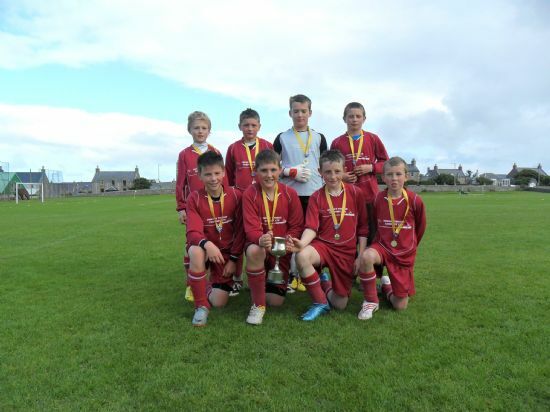 On the Sunday prior to the county games the boys were invited to play in the Andromeda Cup, a Shetland club competition. Orkney West:- Connor Nicolson; Archie Macphail; Zak Mathieson; Alex Stevenson; Toby Macleod; Greg Scott; Morgan Foubister; Oskar Stout and Niall Mackay. Following a penalty shoot-out with Shetland club team Ness United after both teams ended level on points Kirkwall topped Group 1 winning 2 games and drawing the other two. Orkney West narrowly missed out on a semi-final place drawing two games, winning one and losing the other. 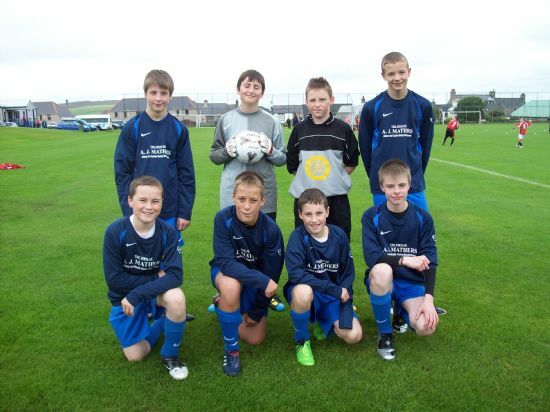 This was a fantastic performance by the young West team who were mostly part of the Orkney Under 11 squad. They can count themselves very unlucky not to have won their drawn games with their only defeat coming against their Kirkwall team mates. Orkney East progressed to the semi-final topping Group 2 winning all their without conceding a goal. In the first semi-final East comfortably won 2-0 against Ness United to progress to the final. In the second semi-final Kirkwall scored an early goal to settle the nerves and eventually ran out 4-1 winners over another Shetland club Whitedale. The all Orkney final was an entertaining game with both sides playing some good football but it was the East boys who were creating the goal scoring opportunities. Eventually Ciaran Drever put the East team 1-0 up and Joe Wilson added a second. Both Orkney teams did well to reach the final, and congratulations go to Orkney East who retained the Andromeda Cup they won last year without conceding a goal. As a warm up for the Under 13 inter county match the following day, two Orkney Under 13 teams Orkney East and Orkney West competed against a number of Shetland Under 14 club teams in a competition held in Lerwick on Sunday 22nd August. Orkney West were represented by:-Taylor Pilkington Tait; Ronan Osbourne; Kieran Docherty; Alex Stevenson; Andrew Harold; Mark Sinclair; Joe Moar and Ross Sclater. The Orkney East team was Sam Kennedy; Jason Scott; Jack Patterson; Logan Peace; Thorfinn Miller; Ryan Sutherland; Seamus Mackay and Liam Delday. The Orkney West team dominated their group winning 4 games and drawing 1, also not conceding a goal. The East team lost their first game, but came strong in their remaining games, to finish runner ups in their group. This left both Orkney teams to do battle in the semi final. The semi final was a tight affair, but the fine defending of the Orkney West team always looked sound, and a breakaway goal from Ross Sclater was a decider in a tight match. The final was dominated by the Orkney West team, and although Shetland team Ness United A hadn't conceded a goal before the final, they were soon 2-0 down, through 2 well taken goals from Ross Sclater. The West team had a nervy last 3 minutes, after they conceded their first goal of the tournament, but held on to secure the title. The victory was especially sweet as both Orkney teams were playing against Shetland teams at Under 14 level. The 2010 Northern Counties Under 12's 7-a-side competition was played in gloriously sunny conditions at Picky on Saturday 5th June. This is one of the top tournaments of the outdoor youth football season with teams from Orkney facing visiting teams from Shetland, Caithness and Inverness Caley Thistle. This year Orkney and Shetland fielded three teams each and Caithness and Caley Thistle two teams, with the ten teams being split into two groups. From the early group matches it was clear that Caley Thistle had sent a strong boys squad up from Inverness as both their teams won their opening couple of games. 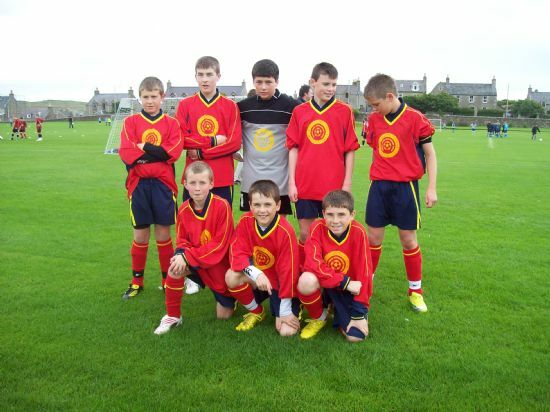 In Group 1 Caley Thistle played the strongest of the Orkney teams - Orkney Red in their opening game. In a game which Caley Thistle won narrowly by a single goal, this was a defeat which proved costly to the Reds hopes of winning the group. While both teams went on to win all their remaining group games Caley Thistle deservedly emerged top of Group 1. In Group 2 Shetland Blue started well winning both their opening games but again it was Caley Thistle's second team leading the way as they won all their four games to top the group. Orkney Green deserve mention as they battled hard to restrict Caley Thistle to a single goal victory. In an all Inverness final it was Caley Thistle Whites who scored two excellent second half goals to beat their teammates to clinch the Northern Counties title for the first time. This was once again an excellent competition with Caley Thistle setting a standard which their northern neighbours just couldn't quite match. At the end of the competition Jim Cormack OYDG Chairman praised the high standard of football on display and thanked the referees, groundstaff, visiting teams and Orkney Aggregates who were sponsoring the tournament for the first time. He then introduced Susan Cruickshank representing the sponsors who presented the trophy and winning medals to the victorious Caley Thistle team. 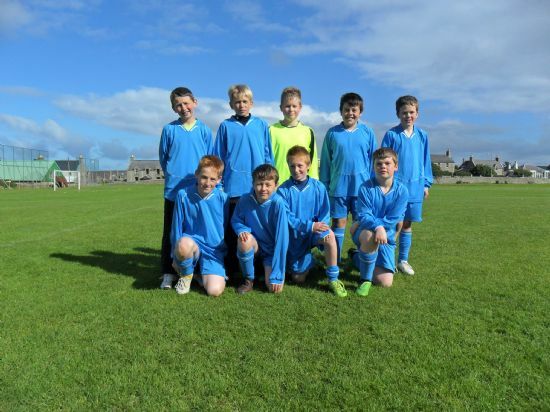 As a warm up to the main inter county games five Under 11 teams took part in a round robin 7-a-side competition at Picky on Saturday - 3 Orkney teams and two from Shetland. Playing some attractive slick passing football the Orkney Green team established themselves as early favourites defeating both Shetland teams by 3-0 in their opening fixtures. The only team to pose a problem for the Greens were Orkney Wine who took an early lead in their match but eventually the Greens drew level and scored a second half winner. They maintained their 100% record with a convincing 5-0 win over Orkney Blue in their final match to deservedly win the competition.Although Orkney Blue failed to win a game they can count themselves extremely unlucky as they lost two of their games to late goals in the final few seconds of the matches.In an exciting competition of particular note was the attacking play of Orkney Green together with very good goalkeeping displays by both Orkney Wine and Orkney Blue goalkeepers.At the end of the competition OYDG Chairman Jim Cormack thanked all those who participated and organised the event. 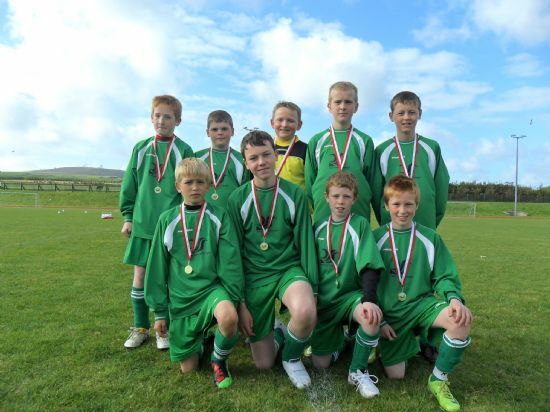 Medals were presented to the winning Orkney Green team by Archie Constable, Shetland team coach. Saturday 27th March saw the OYDG outdoor season commence with Whitedale U12 football team arriving down from Shetland for their annual visit. The competition was held at Picky on the all weather pitch on what turned out to be a reasonable day despite a few cold rain showers, this however did not put off the players who are to be commended for their effort. In total 9 teams entered the competition with 2 groups formed. The winners and runner up in each group then progressed to the semi finals. 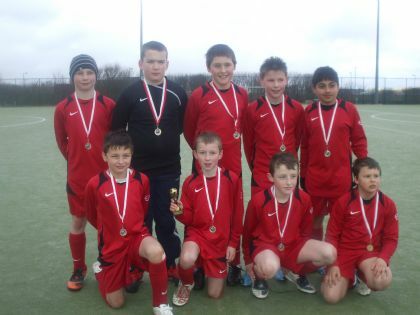 Whitedale A ran out clear winners in Group 2 winning all their games in what was a far closer group. With the rest of the teams beating each other they all ended on 4 points. When goal difference was added up East United B missed out on the semi final but Thorfinn A & B were still tied on -1 goal, next step was to check goals scored and with both teams scoring 2 goals we then reverted to the result between them. With Thorfinn B beating Thorfinn A 1-0 this meant Thorfinn B progressed to the semi final as runner up. In the other semi final Thorfinn C played Whitedale A in what turned out to be a very exciting and close game. Both teams had good chances to score during the game and only an excellent free kick from Thorfinn C late on in the game separated the two teams with Thorfinn C progressing to the final and a rematch against East United A. The final saw East United A control the game right from the kick off and only some superb goalkeeping from the Thorfinn C keeper limited the score to 1-0 at half time. In the second half the East team really turned on the style scoring another 4 goals to run out 5-0 winners with the final goal scored by Arjun Pankhania a real cracker and probably the best goal of the day. At the end of the competition the Whitedale coaches select their choice for player of the tournament and generously present a trophy to the winner. This year they selected Liam Delday of East United A as the winner – well done Liam. At the presentation OYDG Chairman Jim Cormack thanked all those who had helped make the competition such a success, in particular the visiting team from Shetland and we look forward to seeing them again next year. On the Sunday Whitedale headed out to Dounby for another day of football. This fun day allows for younger teams to be entered to gain experience. It had to be played indoors because of the weather In an exciting finish, the tournament Dounby A won by 1 point with Whitedale A in 2nd place and East United 3rd.